Siphonopids, small to medium sized (112 mm to 120 mm total length) caecilians, burrow in moist humid tropical forest floors of South America. They are distinguished by the following combination of characters: oviparity, imperforate stapes and lack of inner mandibular teeth. Species in this family may have forms of parental care but much remains unknown. Many species exhibit maternal dermatophagy, a reproductive behavior in which the young feed on a highly specialized lipid-rich outer layer of their mothers skin using a unique set of "fetal" multicuspid teeth (e.g., Microcaecilia dermatophaga, Siphonops annulatus). Siphonopids were previously placed in Caecilidae until Wilkinson et al (2011); subsequent studies placed Siphonopidae as sister taxon to Dermophiidae. Wilkinson, M., Kupfer, A., Marques-Porto, R., Jeffkins, H., Antoniazzi, M. M., and Jared, C. (2008). One hundred million years of skin feeding? 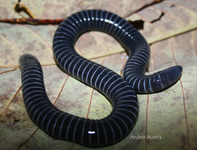 Extended parental care in a Neotropical caecilian (Amphibia: Gymnophiona). Biology Letters, (4) 358-361.